England spin bowler James Tredwell has signed a contract extension with Kent prior to departing for the one-day international series in Sri Lanka. The 32-year-old has been with Kent throughout his career and was captain for the 2013 season. However, he also played Championship cricket for south-coast rivals Sussex during a loan spell last season. 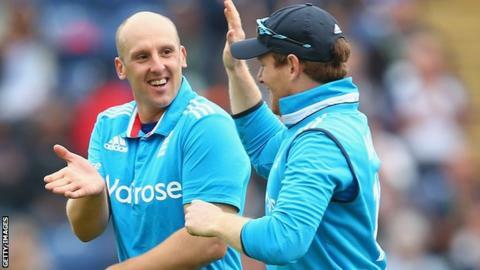 Tredwell has played 39 one-dayers and 17 T20 matches for England, and also won a Test cap in Bangladesh in 2010. The length of Tredwell's new deal at Canterbury has not been disclosed. He has now set his sights on retaining his place for the World Cup in Australia and New Zealand next February and March. "The first step is to be on the plane to Sri Lanka and press your claim for a place in the team before the World Cup," he told the Kent website. "I'll take it one series at a time and you have to take the chance to show what you can do." Kent only finished sixth in Championship Division Two and their T20 Blast group in 2014, but reached the semi-finals of the One-Day Cup before losing to Warwickshire. And Tredwell believes the signs for the county in 2015 are positive. "The future at Kent looks really exciting with lots of homegrown players coming through and I hope to play a part in success going forward," he said. "If we can tighten up in a few areas, we can get the consistency we need to be successful."